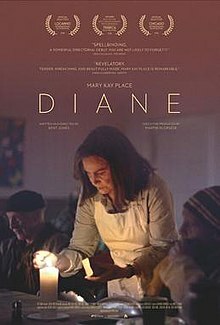 Diane is a 2018 American drama film written and directed by Kent Jones. The film stars Mary Kay Place, Jake Lacy, Deirdre O'Connell, Andrea Martin and Estelle Parsons. It had its world premiere at the Tribeca Film Festival on April 22, 2018. It was released on March 29, 2019, by IFC Films. The film premiered at the Tribeca Film Festival on April 22, 2018. On August 2, 2018, IFC Films acquired distribution rights to the film. It was released on March 29, 2019. ^ "'Diane' Review | Tribeca 2018". The Hollywood Reporter. 2018-04-22. Retrieved 2018-09-30. ^ "Diane". Box Office Mojo. Retrieved April 23, 2019. ^ David Ehrlich (2018-04-22). "Tribeca 2018: Mary Kay Place Is Dynamite in Kent Jones Spiritual Diane". IndieWire. Retrieved 2018-09-30. ^ Brent Lang (2018-08-02). "IFC Buys Kent Jones' 'Diane'". Variety.com. Retrieved 2018-09-30. ^ "Diane". IFC Films. Retrieved November 27, 2018. This page was last edited on 24 April 2019, at 05:52 (UTC).